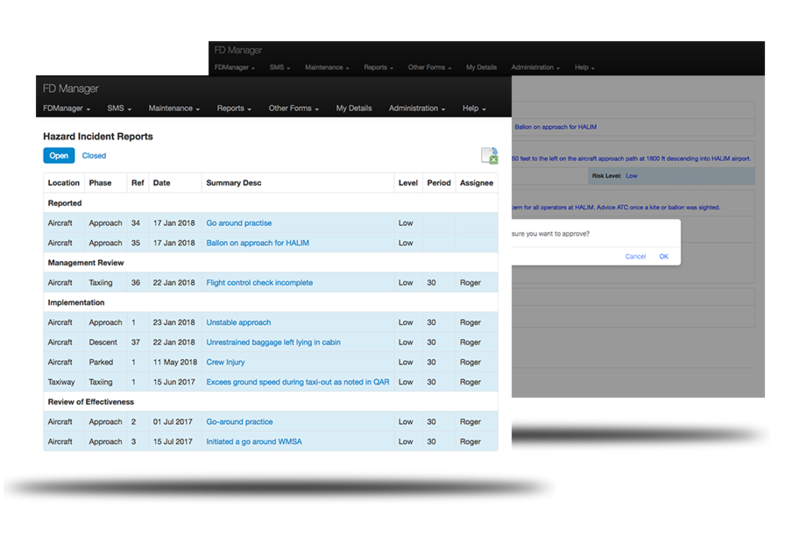 The core function of FDManager is the completion, retention and distribution of the aircraft flight log. All data from the log is maintained in the FDManager database for the generation of completed logs as .pdf’s and management reports. 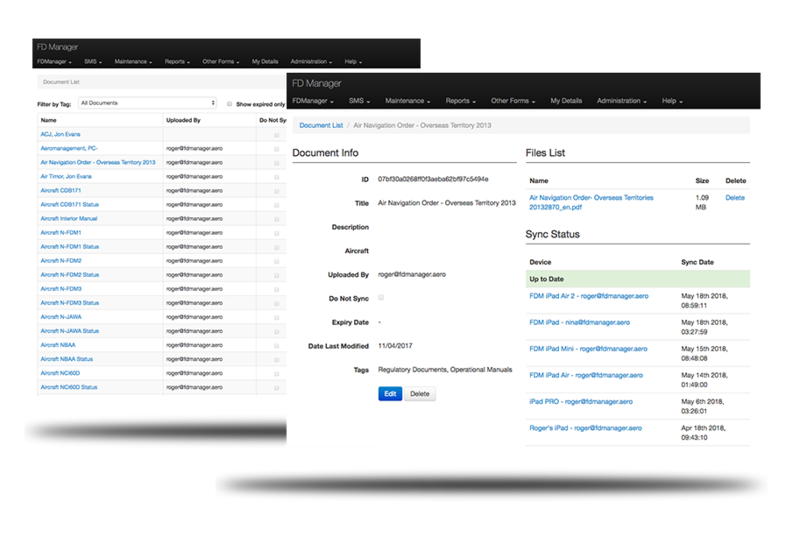 Document Control is provided as a standard feature within the FDManager software suite. 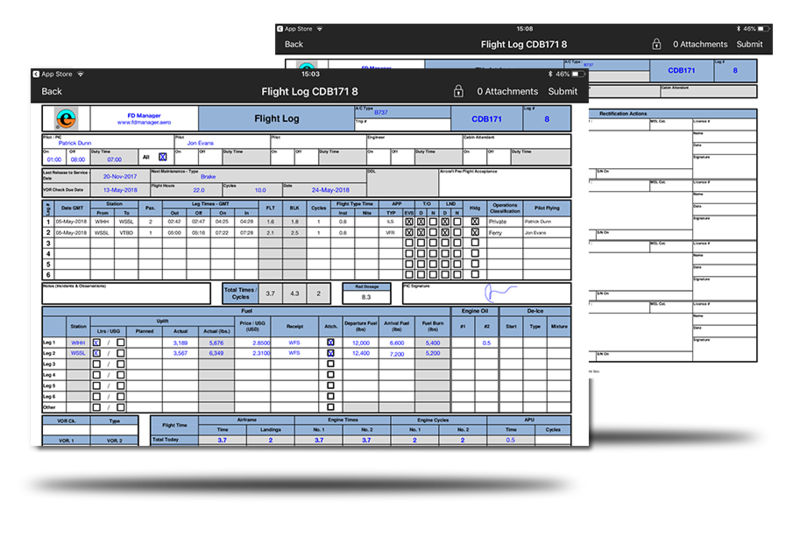 The Document Control function provides control of all company and aircraft softcopy documents onboard from a desktop management portal that is synchronised to the aircraft devices via the cloud. With an intuitive tab based filing system, the Document Control function simplifies the amendment and distribution of documents across the aircraft fleet, complete with a reporting system to measure and record compliance. When synchronized, documents remain available off-line and are viewed through the entrenched e-Book reader. In addition to aircraft and company specific documents, the Document control function also supports flight ops staff a secure location for all of their documentation (licenses, passports, medicals, etc), integrated with the FDManager Calendar function. The system can be configured to provide a variety of dashboards, all individually tailored to provide the latest aircraft data, derived from log book entries. Useful for Lenders, Regulators and other parties such as ownership Trustees, the dashboard provides immediate access to summary data such as aircraft location, last flight details, present total times and aircraft status such as the next scheduled maintenance requirements. The dashboard also serves as a vault for key aircraft data such as ownership contacts, serial numbers and documentation validity. FDManager provides a process management ability in support of a Safety Management System. Starting with standard Flight Risk Assessment and Hazard/Incident reporting forms completed via the iPad App, the SMS module provides automatic process management of the incident review and rectification processes. In addition to the process management, the various modules of FDManager (Administrator, Document Control, etc) are integrated for the collection, retention and control of all company and personnel documents, along with automatic alarms for recurrency, document validity, training, etc. Providing standard or custom reporting on the status of the SMS documentation, FDManager provides a workable snapshot of the compliance along with direct email alerting to responsible parties of events and deadlines. The system also has additional forms within the App, such as Mandatory Occurrence Reporting and can be adapted to meet the individual requirements of customers. 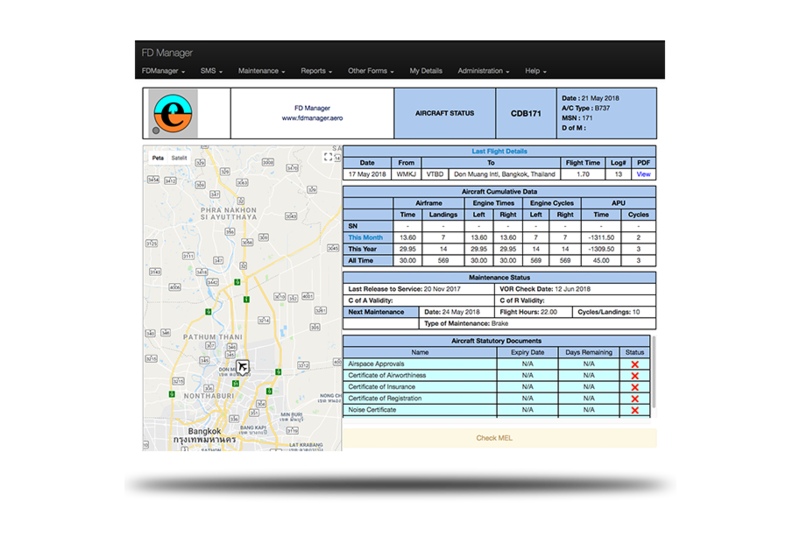 FDManager provides a fully integrated scheduling capability via its web portal. 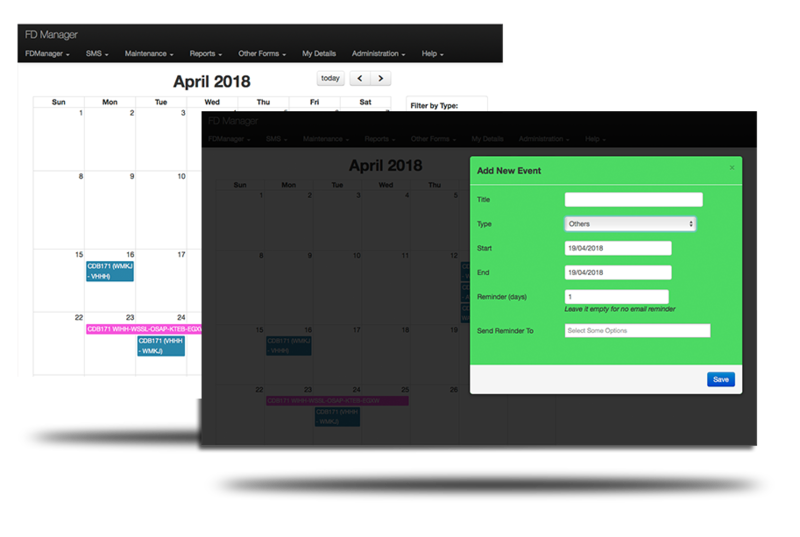 Using an intuitive calendar function, FDManager allows administrators and users to create calendar entries and their associated automatic email alarms. The calendar capability also records past flight operations, including sectors flown, crew on duty and flight hours as well as providing summary reports of future flight schedules, training plans, crew leave, etc. 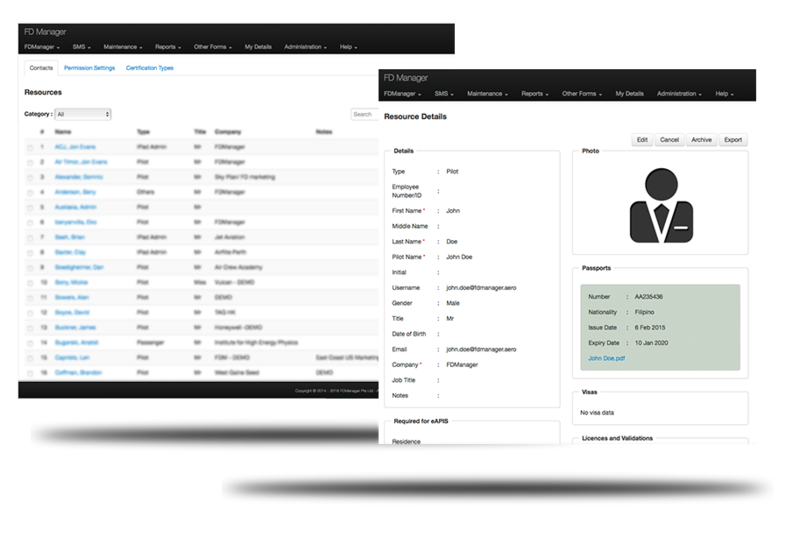 Generate manifests by extracting crew and passenger data from the Resoure Management module of FDManager. Complete passenger details; names, DOB, nationality, passports, etc are maintained within the FDManager database and are either loaded individually or extracted from previous manifests* Passenger note scan also be added to ensure you best meet the expectations and requirements of your clients. Maintain a database of all of your personnel details plus those of your key vendors in one shared address book. Flight Following – Using standard Off / On reports from your existing SATCOM vendor, FDManager provides and email and SMS alerting system to your management chain in the event of a late arrival. Financial Control – Import financial reports of trip specific operating costs and FManager can be used to create historical reports of trip costs and other summary reporting. Expenses – Using the aircraft device, complete and submit crew expenses, including copies of receipts, that can be consolidated with the aircraft flight log file and incorporated into a Financial Control system. QAR Administration – Create a comprehensive system for the analysis, reporting and retention of QAR output data and reports. 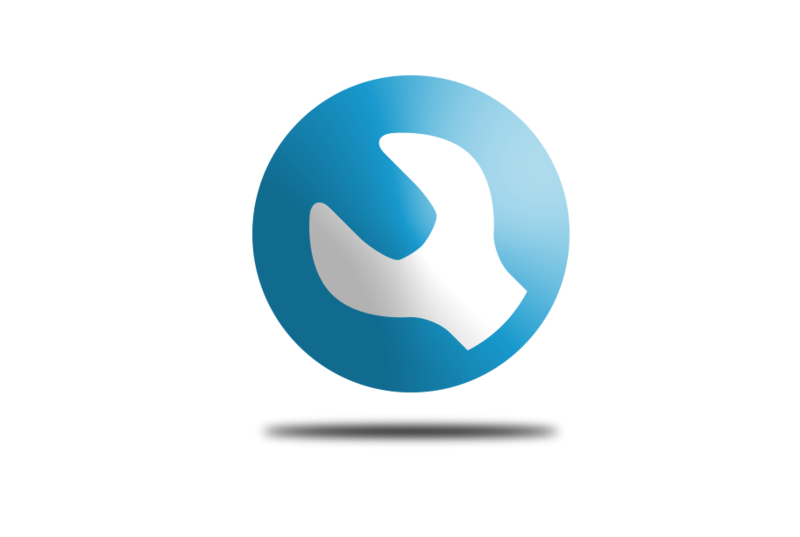 Vendor Reporting – Automatically update third party maintenance planning systems (CAMP & CMP) with the aircraft status, generate and submit monthly reporting for aircraft program vendors such as MSP, CorporateCare, SmartParts and PlaneParts.